Elevated between 4429 ft and 6070 ft, the Ski Resort is among the 3 highest elevated Ski Resorts in the Auvergne. The vertical drop from summit to base is 1640 ft. The average difference in altitude between base and summit of Ski Resorts in France is 2848 ft. Runs and slopes are therefore relatively short. Besse is among the 3 best rated Ski Resorts in the Auvergne. It is among the 3 most family-friendly ski Resorts in the Auvergne. Season starts on Dec 3 and ends on Apr 17 (135 days). Average season duration in France is 118 days. Average snow depth during the season (Dec 3 to Apr 17) is 18 " at summit elevation and 19 " at base elevation. Snow coverage is usually best during March, offering an average snow depth of 32 " at summit elevation and 31 " at the base. Therefore Besse is among the 3 ski Resorts with best snow conditions in the Auvergne. Besse features 52 sunny days on average per season. The average for all ski Resorts in France is 75 sunny days. February is the sunniest month with an average of 20 sunny days. Offering 27 miles of slopes and terrain, Besse is among the 3 largest Ski Resorts in the Auvergne. A resort where you can ski right up to your front door, Super-Besse, located on the southern slope of the Sancy, caters for any skiers at an altitude of between 1300 and 1850m. Whether on an activity holiday or a break with your family, Super-Besse has something for everyone, catering for both fans of skiing and those of alternative ´sliding sports´. 23 ski lifts in total: 1 cable car capable of carrying 20 people (rate: 3,000 people/hour), 5 chair lifts, 16 ski tows, 1 moving walkway. 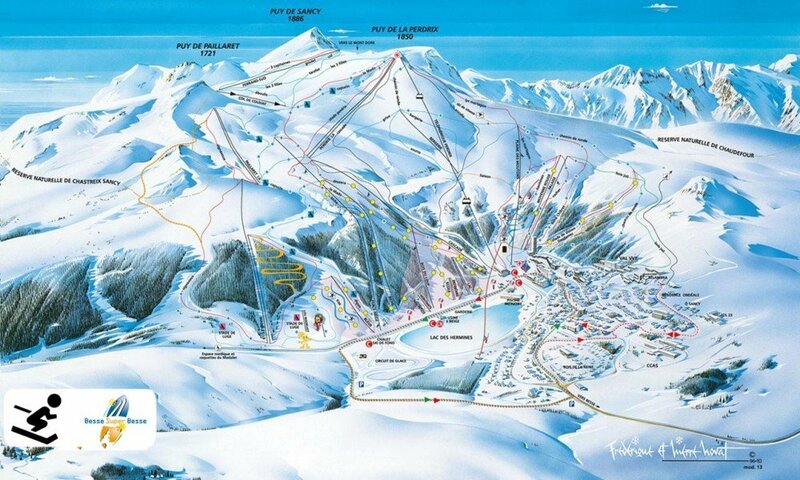 1 area for night-time skiing with 4 green slopes, 2 blue slopes, 5 red slopes including 1 snowboard cross slope, 2 black slopes including 1 slalom course.